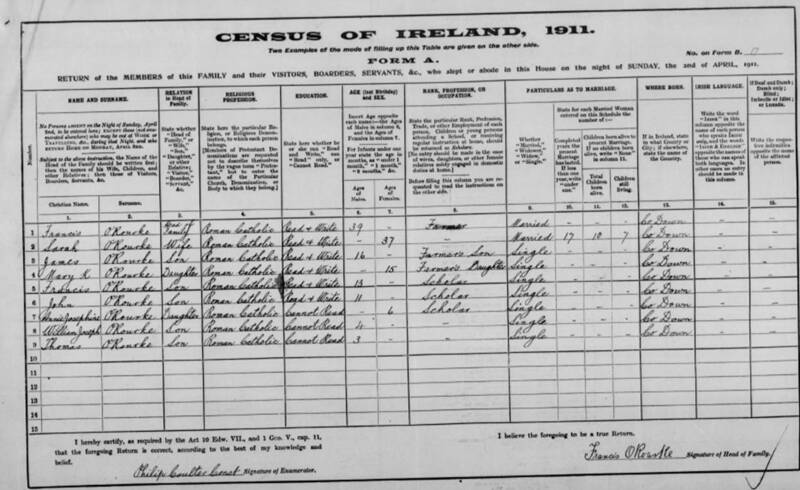 All of the 19th century Irish censuses have been lost or destroyed, and the only two 20th century censuses to have been released so far are 1901 and 1911. Of these, only the 1911 Census is currently available online. There are nearly 5 million inhabitants recorded in the census, so unless you're looking for someone with a very rare name you'll need to know a little more about them, or their family. Fortunately, because 1911 is less than a century ago, there's a good chance that you'll know when at least some of your Irish relatives were born, and roughly where they may have been living in 1911. 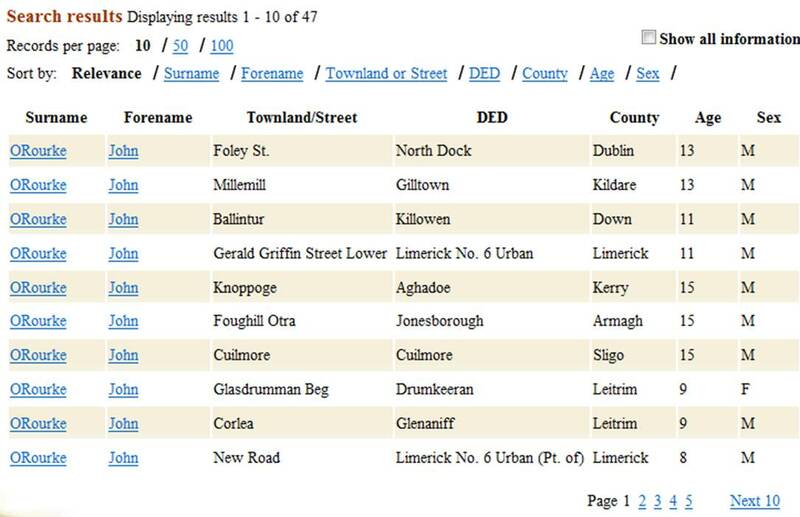 Many Irish surnames begin with O' (for example, O'Rourke) but they won't all be recorded this way in the census. 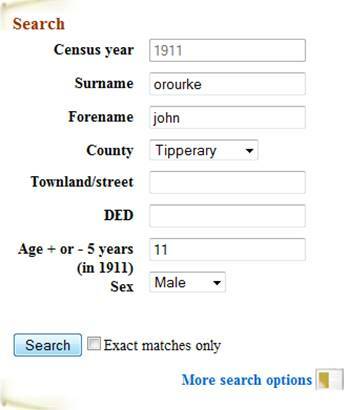 For this reason I'd recommend that you don't tick the 'Exact matches only' box on the search form, since you'd like to see all the results that match - whether the surname was written down as O'Rourke, ORourke, or O Rourke. Enter an age if you can - the Search automatically allows a 5 year band on either side, so it doesn't matter if you're a year or two out. If you know the county where your relative was living then that's bonus - but remember that people did sometimes travel to find work. Should you know the precise address then you can make use of this information to search by location - but do read the Help information first. 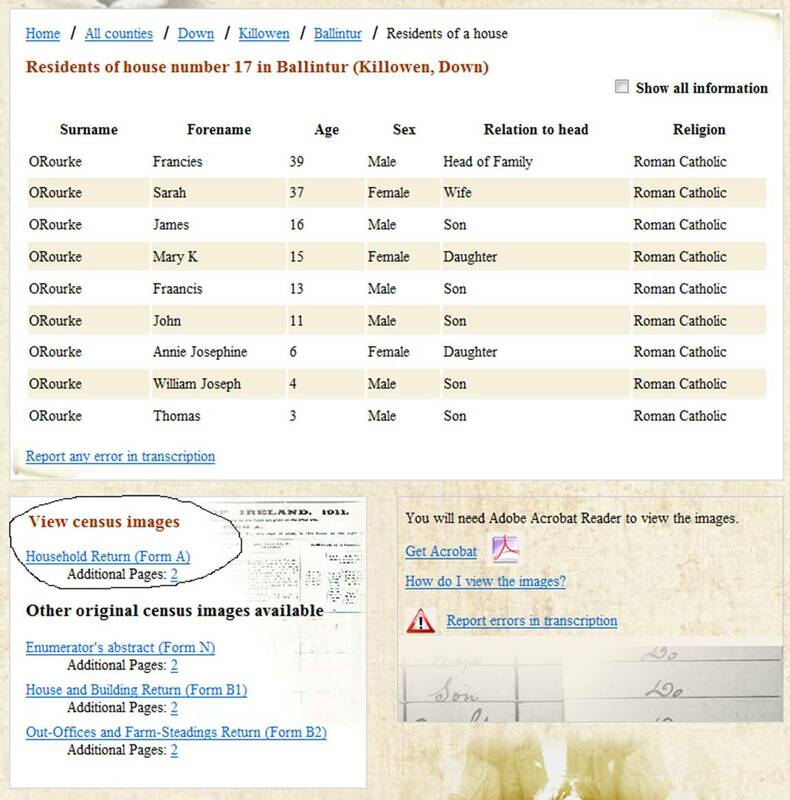 Note the section headed View census images: this has links to the original census schedules. Private households were issued with a Household Return (Form A), but there were also other forms for institutions such as boarding schools, workhouses, barracks, and hospitals - this include Form E, Form G etc. Alternatively right-click the link and choose Copy link (or the equivalent in your browser), then paste it into a Word - or other - document. You can then pick out the number you need without having to write it down. First log-in to your LostCousins account. If you can't remember your password you can get a reminder by clicking Password reminder at the top left of the menu and entering your email address; if you don't have a LostCousins account then click Register to open one - it's free. I've typed capital letters at the beginning of each name, but this isn't actually necessary when you're entering names in the main part of the form, as initial letters are automatically capitalised. You'll also see that I've corrected the errors made by the transcriber, who misread Francis as Francies, and transcribed O'Rourke as ORourke - in other words I've entered what the enumerator wrote, rather than what the transcriber thought he had written. However, whilst the enumerator may also have made mistakes, on this first part of the form you should never include information that isn't on the handwritten census, even when an error omission is obvious. Nevertheless provision has been made should you wish to input additional information and corrections. It's worth explaining at this point what the two icons in this screenshot mean: the symbol indicates that something has been entered in the Notes box for this relative - click it to display the note; clicking the icon enables you to enter another member of the same household more quickly - that's because the NAI number and surname will be filled in automatically. Whereas entering the first person in the household - Francis in this case - typically takes 20-25 seconds, entering each additional member of the household needn't take more than 10 seconds, so usually it will take only 1 or 2 minutes to enter an entire household, even a large one like the O'Rourke family. Alternatively, if you want to enter relatives from a different household click New household (I've drawn arrows on the diagram above to highlight those two menu options). 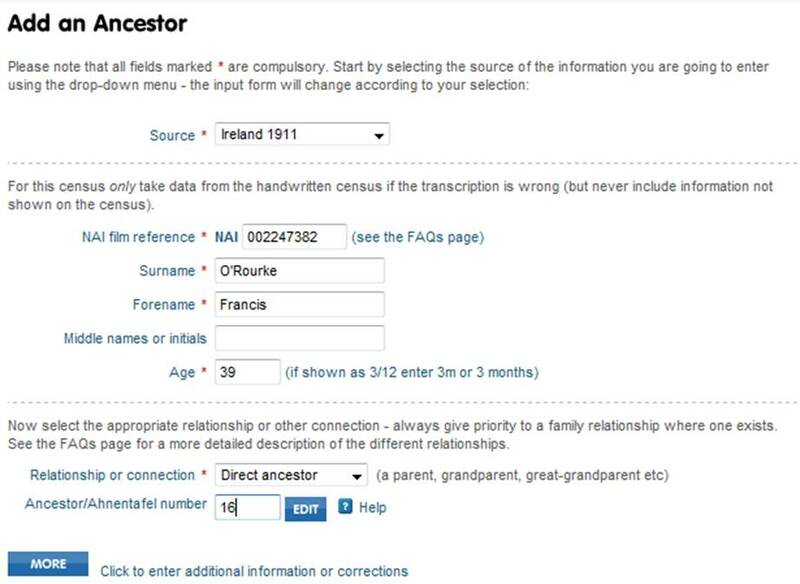 Once you've entered at least one relative on your My Ancestors page you can click the Search button at the top of the page at any time to carry out a global search for your living relatives - global in the sense that we'll compare all the entries you've made, whether from the Irish census or any of the other censuses that LostCousins supports, against all the entries made by other LostCousins members, wherever they are in the world. No matter how many entries there are on your My Ancestors page it won't take more than a few seconds to carry out this search. When it is complete you'll be told how many new matches have been found, in other words how many of your relatives have been matched for the first time with those of other members. Don't worry if you aren't immediately successful in finding 'lost cousins' - there are new members joining LostCousins all the time. It takes just seconds to log-in and click the Search button, so if you're particularly anxious to find new cousins, why not do this once a month? Just remember that the more relatives you're able to enter from the censuses, the more 'lost cousins' you're likely to find. For example, a member who has entered 100 relatives can expect to find 20 times as many cousins as a member who has entered only 5 (though in the short-term there's an element of luck involved - you could hit the jackpot with your very first entry!). See the article Hints and Tips for Keen Researchers on the Help & Advice page for more detailed advice.